Tropical Treat Video Slot Review - Casino Answers! Tropical Treat is a 5-reel, 50-line video slot developed by Slotland, featuring two wild symbols, multipliers, a free spins feature and a progressive jackpot. You can play the Tropical Treat video slot at Win A Day Casino. Bets on the Tropical Treat slot machine are $0.01, $0.02, $0.05, $0.10, $0.25, $0.50, $1, $2, $3 and $4 per line. You can select up to 50 paylines using the “+” and “-” symbols on the sandcastle to the left. You can bet anywhere from a penny per spin up to the maximum total bet of $200 per spin. Tropical Treat has a very good betting range, ideal for casual players or high rollers. You can play the Tropical Treat slot game by selecting your bet and pressing the Starfish “Spin” button. Tropical Treat features a progressive jackpot, which is presently at $31,898. To win the Tropical Treat Progressive Jackpot, you must make a total bet of $5 or more and land 5 Compass symbols on a selected payline. If you bet less than $5, you will instead win the 1000 coin top fixed payout. You can win the Tropical Treat Progressive Jackpot by playing at Win A Day Casino! The Wild symbol will substitute for any other symbol to form a winning combination on an active payline. There is also a Double Wild symbol, which is a wild multiplier symbol. This symbol not only substitutes for all other symbols, but will also double your winnings. 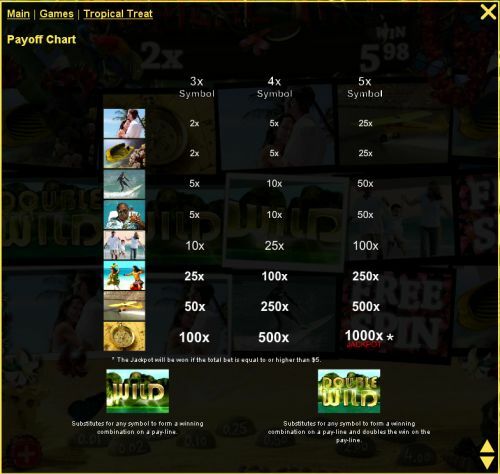 The wild symbols cannot win free spins on the Tropical Treat video slot. By hitting 3 Free Spins symbol anywhere on the reels, you will win 10 free spins. If you land 4 symbols, you will also receive a 2X multiplier. By hitting 5 symbols, you will win a 5X multiplier for the free spins feature. If you re-trigger the free spins feature, the free spins count will be reset to 0. Tropical Treat has an autoplay mode. You can select 5, 10, 25, 50 or 100 autoplay spins. You can stop the Tropical Treat autoplay mode at any time by pressing the autoplay mode. 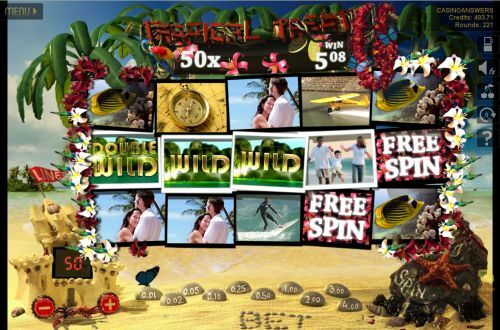 Tropical Treat is a solid 50-line video slot on the Slotland platform. It has a fair number of special features – free spins, two wild symbols, multipliers and a progressive jackpot. You can play the Tropical Treat video slot when you sign up and make a deposit at Win A Day Casino. Where can USA players play the Tropical Treat online slot for real money? No matter where you are in the world, you can play Tropical Treat at the USA-friendly Win A Day Casino. Can I play a flash version of the Tropical Treat slot game in my browser? The instant play version of Tropical Treat is actually the only version currently available. You can play the instant play version of Tropical Treat in your browser at Win A Day Casino.